A British woman who was among 50 people killed when a Boeing airliner crashed near the Russian city of Kazan on Sunday has been named as Donna Bull. 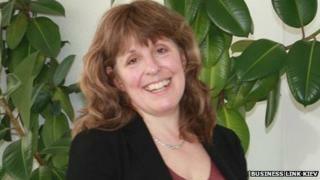 The 53-year-old, who taught at Bellerbys College in Cambridge, was a wonderful mother and dedicated professional, her family said. All 44 passengers and six crew died when the Boeing 737 exploded on impact while trying to land at Kazan airport. Authorities say the plane plunged vertically into the airport's runway. Officials have recovered both "black box" flight recorders but it is thought they may be damaged. An investigation is under way, focusing on whether the crash was caused by a technical malfunction, pilot error or poor-quality fuel. There are no suspicions that it was a terrorist attack. Media captionAmong the dead was Irek Minnikhanov, son of the president of the Russian Republic of Tatarstan, as Tim Allman reports. The pilot was attempting his second landing when the crash happened, it is being reported. The crew had said they were not ready for landing but did not specify the problem, Russian news agencies said. The Tatarstan Airlines airliner had taken off from Moscow an hour before the crash at about 19:20 local time (15:20 GMT). Ms Bull had been travelling to Kazan for the start of a 10-day marketing trip. Her Moscow-based colleague Yana Baranova, with whom she was travelling, also died in the crash. Ms Bull's widower Robert Crome said: "This is a very difficult and emotional time for all of the family trying to come to terms with the shock and loss of Donna. "Donna was a wonderful mother to George and Kate - kind, thoughtful and caring to her family and her many friends," he added, in a statement issued through the Cambridge News. "She was also a dedicated and hard-working professional, as a teacher and educationalist, so her students will all miss her greatly. Words are inadequate to express our grief and loss." He added that he hoped the UK and Russian authorities could help "ease any administrative difficulties". Ms Bull joined Bellerbys Cambridge in April 2012 as an A-levels programme manager. James Pitman, managing director of Study Group which runs Bellerbys Colleges, said Donna was a "very popular and well respected member of staff and will be sorely missed by both her students and colleagues". "Yana, although based in Moscow, forged close relationships with Bellerbys staff in the UK in her capacity as recruitment manager and will likewise be sorely missed." He added that the college would be closed for teaching on Monday but would open for staff and students to come together to grieve, and counselling would be on offer. UK Foreign Secretary William Hague also expressed his condolences. Among the dead was Irek Minnikhanov, a son of the president of the Russian Republic of Tatarstan, according to the official passenger list. Two of the victims were children. Russian President Vladimir Putin "expressed his condolences to the relatives of the victims in this horrible disaster", his spokesman Dmitry Peskov was quoted by the news agency Interfax as saying. A government commission has been set up to investigate the cause, he added. Psychologists are offering help to family and friends of the victims and the government has promised them financial compensation. Kazan lies about 720km (450 miles) east of Moscow, from where the plane had taken off. UK Foreign Secretary William Hague has expressed condolences for the loss of life, saying his thoughts were with the friends and family of those involved. He added that consular assistance was being given to Donna Bull's family and the British Embassy in Moscow would stay in close contact with the Russian authorities. The BBC's Daniel Sandford in Moscow said that although some of Russia's biggest airlines now have very good reputations, frequent crashes by smaller operators meant the country had one of the worst air safety records in the world.